Well, it’s that time of week again. Time for a review! 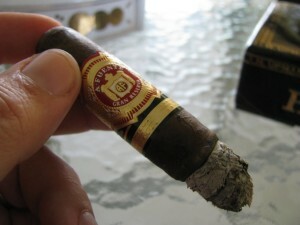 This week, we’re taking a look at the Sungrown version of the Arturo Fuente 858. The 858 takes its name in honor of Arturo himself, who was instrumental in developing the blend. 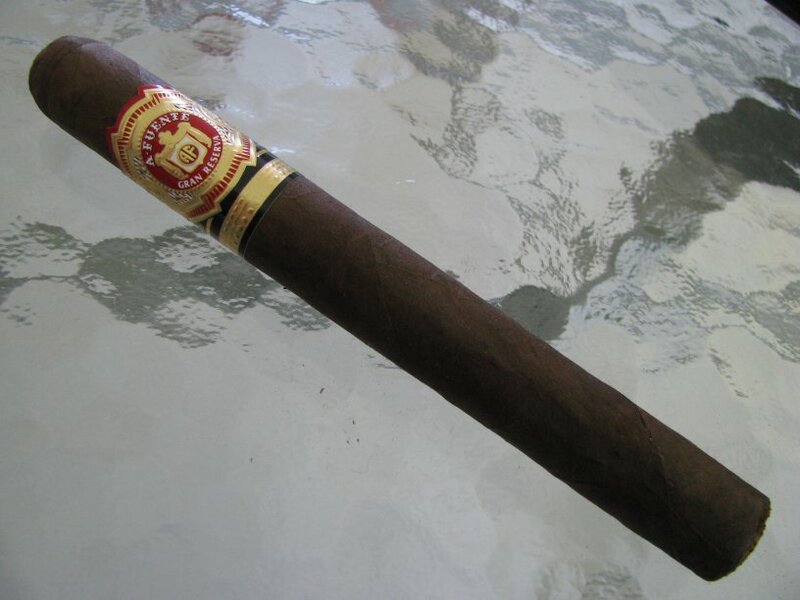 In fact, Carlito Fuente has said it was his grandfather’s personal blend. When he (Arturo) died at the age of 85, the family brought the 858 to market under the name “858” as a palindrome and reminder of their patriarch. 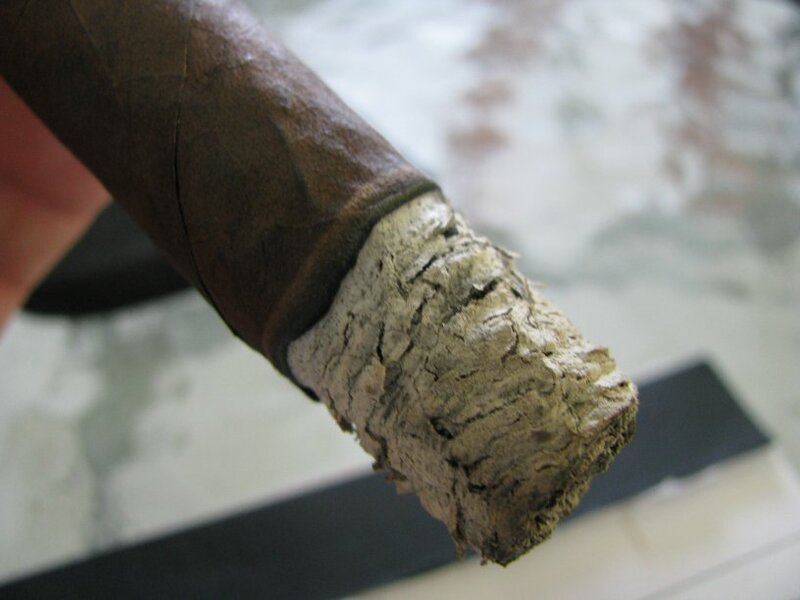 The cigar is 6″ long, a 47 ring, and comes in 5 different wrapper offerings. The “standard” lines are the natural (Cameroon) and maduro (Connecticut Broadleaf). I would also include the claro (Connecticut/candela) as standard production as well, although it is less common on retailer shelves. I would imagine this cigar is readily available, just not quite as appealing to the current market, which probably drives somewhat lower production numbers (pure speculation on my part). The remaining two wrappers are far more difficult to come by – the SG Rosado (cedar wrap/red band on the foot), and the Sungrown (cedar wrap/black band on the foot/Ecuadorian Sungrown wrapper). Production has seemed erratic for these final two offerings in previous years, but happily I have seen considerably more locally in Tampa this past year than ever before. The filler and binder are Dominican, and wrappers as noted above. You can find the standard production sticks for $4-5, and the Sungrown for about $7, depending on your local market. Of course, there are plenty of folks out there who mark them up considerably more than that. Today’s example comes from the most recent release, which arrived at my local B&M in late summer. So, it has been resting comfortably at 65% in my humidor for several weeks. When removing it from the cellophane and cedar wrap, I noticed an almost uncharacteristic even brown color to the wrapper. These often have a mottled look, with some small degree of graying in the coloration. This one, however, is uniformly brown throughout the cigar. Perhaps due to this uniformity, or the typical quality of construction I’ve come to expect from Fuente, the seams of the wrapper leaf virtually disappear. The thin veins are more easily visible than the spiral of the roll. The wrapper leaf is mildly oily – not enough to leave a residue on my fingers, but enough to give the wrapper a soft, smooth feel. Prelight, the aroma of the wrapper is noticeably influenced by its time in the cedar sleeve. The foot, however, produces a more traditional, typical tobacco scent. The cold draw is reminiscent of hay, and a bit toasty. Upon applying my torch, a small crescent on one side of the foot was atypically resistant to lighting. This self corrected within a couple of minutes, though, and presented no problem. The toastiness I found in the prelight draw is front and center, offset with a slight cedar flavor which I again attribute to the cedar wrap these ship in. Although still very much present, these flavors do quickly subside within the first half-inch, and are enhanced by a creamy sweetness – not something you might associate with the sweet notes often found in a maduro, just an indefinable, but welcome changeup from the initial cedar. By the 1″ mark, and through to 2″, the cigar continues to develop nicely, and has the normal straight burn I now judge other cigars by. The flavor has taken a more citrus-like note, with an occasional waft of what reminds me of allspice – not what you might find in your spice rack, but more akin to the smoke from an honest-to-goodness allspice fueled fire used to prepare jerked pork. By 2″ and beyond, I find many of the same flavor “remembrances” as in the earlier portion of the cigar, with maybe a slight increase in the prominence of the citrus note. One thing worth a mention here, is the consistency of the even burn. As in most examples of the Fuentes’ offerings, the burn in this cigar remains strikingly true, and has yet to require even a single touchup. This, coupled with the dependable draw I find in most Fuente cigars, makes me appreciate their products even more. Having to fumble around and take care of construction issues always turns me off to a cigar, even when the flavors are pleasant. Coming into the final stretch of the cigar, I find the strength a little more bold than found in the early smoking. However, it remains very clean to the palate, never harsh nor acrid. Overall, I place this cigar very near dead center in terms of strength. Not so mild as to fail in delivering great taste, but not so heavy as to give anyone headspins or cold sweats. By the final minutes of the smoke, the flavor has progressed into a delicious presence of mildly sweet tobacco goodness, which lingers slightly on the palate. In fact, this is one of my favorite parts of this smoke. It reminds me of visits to tobacco barns as a kid, with its somewhat musty sweetness of curing tobacco. What really stands out for me in this smoke is the unwavering quality of construction and dedication to blending I find in the Fuente team, as well as this particular blend, which is a step outside the box I find many blenders in today. Personally, I find the cigar market one of extremes lately – there seems to be a great demand for towering spice bombs that can border on nasal napalm or wishy-washy sticks with the most interesting flavor noted as that of cardboard packing boxes. The 858 is a comfort smoke for me, especially in this wrapper. It is simply enjoyable. I never have the distractions of inconsistency or poor build. The construction is always dead-on, the strength as “medium” as might be humanly possible for my tastes, and the flavors are both pleasing and interesting. All these things make for a fantastic cigar that facilitates conversation and contemplation, two of the greatest aspects of our hobby. It is no secret amongst the Cigarmy that this is one of my favorite Fuente sticks, and in fact, one of my favorite of all cigars. So, I think just this once I’ll forego the numeric rating system (which I haven’t finalized anyway), and just let the written review stand alone – and thus avoid admitting how biased I truly am about this stick. All I can say is if you can find them, by all means give them a try.